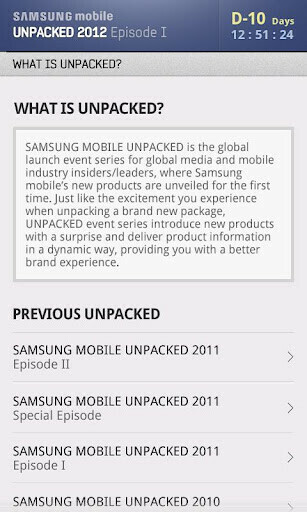 Just as it did last year, Samsung is making a special app available for its UNPACKED event. The app is perfect for those at the event in London, or those just keeping up on the action from home. 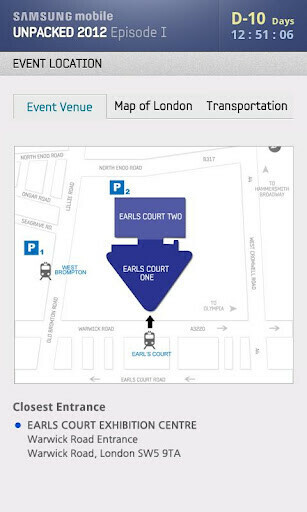 If you are attending, the app displays maps and an event schedule so that you don't miss a thing. For those of you keeping an eye out from home, the app offers live streaming of events, press releases and there is even a dedicated button for YouTube videos and your Twitter and Facebook feeds. As you are no doubt aware, the Korean based manufacturer is expected to introduce the most eagerly awaited smartphone of the year to date, the Samsung Galaxy S III, on May 3rd. You know how important this announcement is judging from the number of different sources who have come out to spill the beans on the specs of the device. Speculation about the sequel to the wildly popular Samsung Galaxy S II started all the way back last September. Back then, there was talk of a 4.65 inch Super AMOLED III screen with pixel density of 352 ppi. 1.5GB of RAM was expected along with as 10MP camera and a 2250mAh battery. Earlier this month, the speculation was that the Samsung Galaxy S III would offer a 4.65 inch Super AMOLED display, the first of its kind to use RGB technology. The latest word is that the Samsung Galaxy S III is just an incremental update to the previous model, similar to the Apple iPhone 4S and the Apple iPhone 4. In fact, it might be introduced with a completely different name. I really hope that gs3 will use the mali t608 gpu even though rumors point to just a overclocked mali 400. It'll just be a let down kind of like the g nex with the powervr sgx540.